The sofa is more than merely a cushion for your derrière or an aid to pull a Netflix all-nighter. It is a centrepiece, and if you care enough, whatever your choice may be will say a lot about you. We know, we know. Choosing a sofa can be more traumatic than picking your bride. But if you’re the type of guy who’s tech-inclined, sophisticated and picky as hell. You’re on the right page. Meet the King Living’s King Cloud III, where form meets function and technology meets style. Founder David King tells us more. What kind of man do you see liking the King Cloud III? He’s a sophisticated and discerning man who does things his own way. He’s cerebral and pragmatic; he likes to understand how things work, find purpose in experiences and appreciates quality that lasts. He hates clutter too, and he prizes form, function and comfort over ostentatious displays. King Living is big on modular furniture. How versatile is the King Cloud III? There are 32 different sofa configurations the sofa can morph into. There is also an option for a wider seat, adjustable legs and variable armrest widths. And as with all King Living sofas, the covers come with a choice of premium fabrics and leather which can be professionally removed or replaced for cleaning. Why do you think there is a need for modular furniture? In a city like Singapore, many are without the luxury of space. Furnishings with storage and modular features like our Delta and Jasper sofas are ideal for maximising HDB layouts. First time homeowners should see furniture as an investment, one that can last a lifetime but also change as they move into different spaces. Our modular furniture is built for change with countless configurations and add-ons to last a lifetime. People move, lives change and so it is our goal to evolve as taste and styles change. We like the way it looks, but how sturdy is the couch? Have you noticed how car seats are made from steel and not timber? Steel frames allow for a steel suspension so the cushion doesn’t bear the brunt of everyday wear and tear. The same goes for King Living’s signature steel frames, which are the backbone of all our sofas. They are super tough. When we developed the original steel frames, we tested the strength by driving a truck over. High-grade steel is cut with additional spot welds applied to key stress and weight-bearing areas for additional strength. 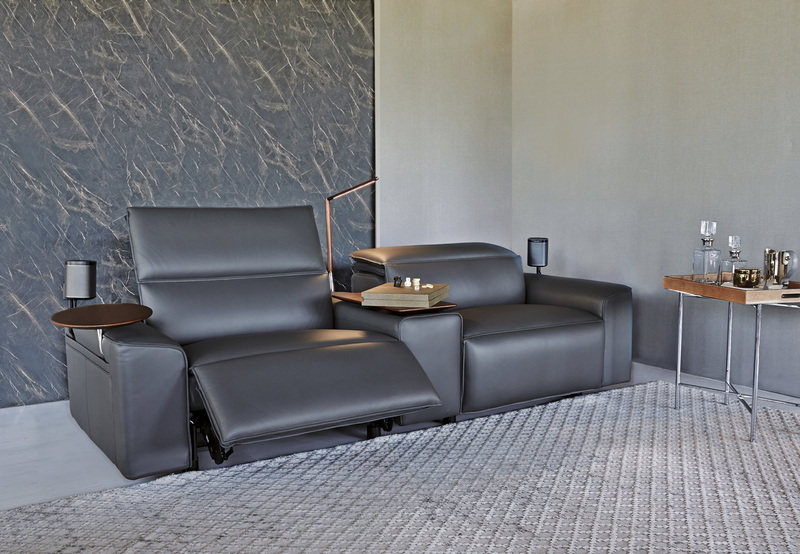 The weight limit for the recliner mechanism used in the King Cloud III is 120 kg per seat. That of the footrest is 15 kg. What’s the one last thing you’d like people to know about the couch? King Cloud III is equipped with a discreetly integrated TouchGlide Technology. It allows the sofa to effortlessly alter the position of each seat and headrest to suit your preference. Users slide their fingers over the buttons to adjust their seats and a Gesture Control memorises your favourite posture, which can be recreated with a simple swipe of the hand. The couch also comes with optional Smart Pockets stitched into the sides on the arms and back to store your TV remote and magazines. These can also accommodate removable side tables that are built with phone-charging points and LEDs. Lastly, if you want the ultimate surround sound experience, the sofa can be configured to accommodate a subwoofer.